(Index) Saturday afternoon, the series of demonstrations against the Overtime Act continued in Budapest and numerous countryside locations. There were demonstrations or roadblocks in Miskolc, Tatabánya, Debrecen, Sopron, and many other places. The organisation behind the countrywide protests is the National Strike-preparation and Demonstration Organising Committee, consisting of the Hungarian Federation of Trade Unions, the Cooperation Forum of Trade Unions, and the Confederation of Unions of Professionals. Meanwhile, preparations for what this Committee hopes to be a general strike are on their way. On Saturday, four smaller groups of protesters marched to Budapest’s Castle Garden from different Budapest locations. In the end, approximately two thousand people arrived at the square beside the Danube. After a few short speeches, the organisers started showing live feed from the countryside protests on the screens. One of the protesters said that today’s Budapest event was mostly in support of the ones happening in other parts of Hungary. After the official end of the protest in front of the Castle Garden, a part of the crowd decided to march back to the Parliament. As they were crossing the Chain Bridge, police were already waiting in large numbers for the couple of hundred protesters, blocking their way at the head of the bridge. The crowd gradually dispersed after this, with the last few protesters being carried off the bridge by the police at around 6:30 PM. The protest titled “Let’s shut down the country” might not have managed to do just that, but there were a large number of parallel protests all across Hungary with varying attendance – Car convoys slowed down traffic in Salgótarján, Zalaegerszeg, Veszprém, with the largest one in Szekszárd, made up of around a hundred cars. Sixty cars blocked a side of a road in Nyíregyháza, while a 1-kilometre car queue halted traffic in Keszthely. More than a thousand people protested in Miskolc, there were demonstrations in several other towns, such as Sopron, Debrecen, Székesfehérvár, Keszthely, and a number of other places. All in all, the protesters in the countryside heavily outnumbered the ones in Budapest, which is quite a rare occurrence in Hungary. 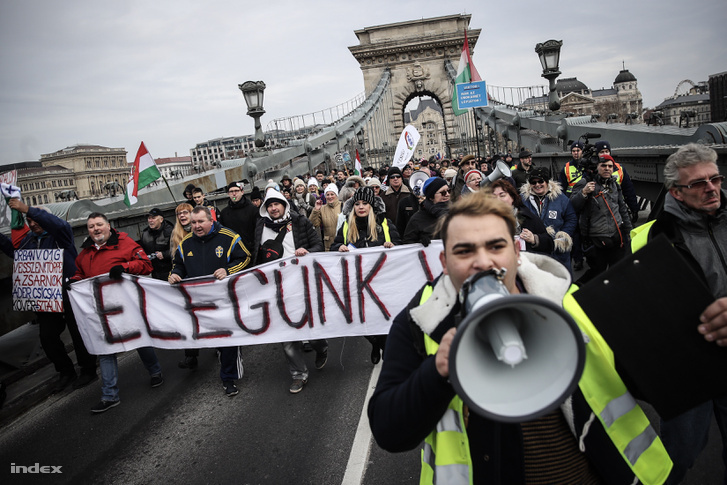 Hungarians abroad also joined: there were gatherings in solidarity with the Hungarian protesters in Oslo, Vienna, Dublin, London, München, Berlin, and Hamburg. The immediate revision of the Labour Code with special regard to the regulations in connection with overtime hours and overtime banking. Recodification of the right to strike, with a social dialogue open to compromise on substantial issues, with a focus on the interests of employees. Proper wages for proper work, easing wage inequalities, restoring the advantageous system of benefits, and increasing the wages of state employees. A new, more flexible pension system including the updated restoration of the previously abolished early retirement options and support for disadvantaged or disabled workers. The government’s explanation of today’s events is no different from before – Hungarian government spokesperson István Hollik released a statement saying that the amendment made to the Labour Code is merely a good excuse for George Soros to kick off his campaign for the European Parliamentary Elections of 2019. Leaders of the trade unions promised a general strike at one of December’s protests if President of the Republic signs the Overtime Act into law, which he subsequently did – therefore the Hungarian Federation of Trade Unions, the Cooperation Forum of Trade Unions, and the Confederation of Unions of Professionals formed the National Strike-preparation and Demonstration Organising Committee. They have sent their formal letter of demands to the Prime Minister and set a 5-day deadline for the government to appoint a competent person with whom trade unions can negotiate. This Monday, the reply from Mihály Varga, Hungary’s Minister of Finances was “attained” by Magyar Idők, a daily paper belonging to the government’s gigantic new media conglomerate. In his response, the minister rejected the possibility of a dedicated government negotiator and deflected the matter to the existing forums of reconciliation. The existing forums, that are more like briefings where the unions are not involved in decision-making according to the complaints included in the preparatory committee’s original letter to the Prime Minister. In the meantime, several other trade unions and federations expressed their support for the initiative or their intent to join the preparatory committee. Last Saturday, the Independent Police Union published a supporting statement, noting that members of the police force are also subject to exploitation. The statement reads that law enforcement forces are severely understaffed (there are 90 policemen for every 100,000 citizens, as opposed to the EU average of 318), and that fact coupled with the current the state of migration crisis declared by the government lead to an exceedingly high number of overtime hours. The next day, the Democratic Union of Teachers formed their strike committee as well, and on Monday, another huge organisation, the LIGA group of trade unions joined the above-mentioned preparatory committee. The first actual strike announcement came from the Trade Union of Hungarian Public Officials, Public Employees and Public Service Workers. They plan to suspend work on 14 March 2019, a day before March 15, one of Hungary’s most observed national holidays. The announcement comes after multiple objections concerning the low wages and the recent government measures that negatively affect those employed by the state. Earlier, president of the Cooperation Forum of Trade Unions András Földiák told Index that if no significant advance is made until the protests on Saturday, then they will start organising the general strike beginning next week. He told us that he’s hopeful, as countryside trade unions already show unusually increased activity without any instruction to do so. 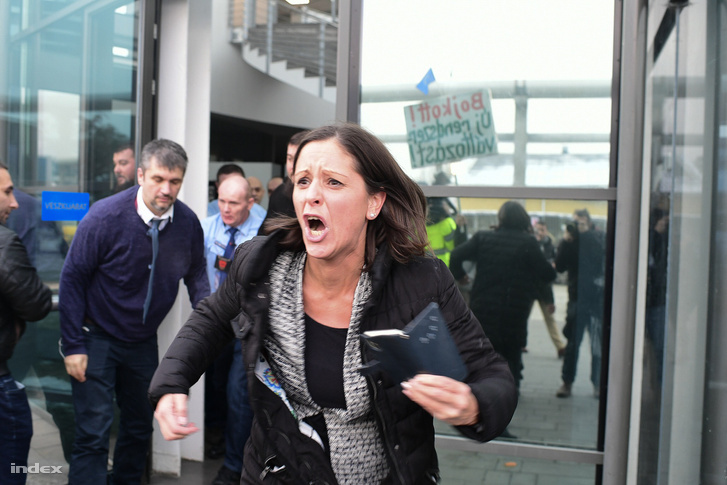 Földiák said that there is no way that any court would qualify this strike as a political strike (which would make it illegal, as strikes can only be legally organised for social or economic goals). He explained that even though the demands were addressed directly to the government instead of individual employers, they are clearly worded in defence of the workers’ interests. He also said that due to the legally complicated process, the earliest possible date for a general strike is somewhere around the middle of February. At this phase, they are yet to make any estimates regarding the number of workers likely to participate. Saturday’s protests are the latest in an ongoing series of a wide variety of demonstrations that started back in December, right after ruling coalition Fidesz-KDNP’s parliamentary supermajority passed the Overtime Act. The new law made 400 hours of yearly overtime and a three-year overtime banking period possible under certain conditions. That same day the Parliament established a parallel court system set up under government oversight that will have jurisdiction over all court cases against state authorities. Opposition parties tried to obstruct the vote by not allowing the Speaker to approach his podium, but the Speaker opened the session anyways, and the laws were passed while opposition lawmakers blew whistles and sounded sirens before leaving the chamber and taking to the streets. Trade union leaders followed suit and after President János Áder signed the Overtime Act, they announced the preparation for a general strike in 2019. The protests against these laws soon branched out to condemn the entire system of government built by Fidesz, culminating in thousands of protesters marching to the headquarters of Hungary’s public media demanding them to put an end to government propaganda. MP-s entered the building to get airtime for the protesters’ demands, but after spending the night, they were subsequently thrown out of the building. Since then, more controversy surrounding the inaccuracies and manipulative content in recent news reports of the national TV prompted MPs Bernadett Szél and Ákos Hadházy to return to the offices of the public media on Monday to talk to its managing director Dániel Papp. The staff first tried to prevent the MPs from entering by asking them to go through a different gate – which then they proceeded to lock. Papp did eventually see the MPs in person, but only to instruct them to send him their inquiries in writing. The MPs, wanting answers, spent the night in the building once again. Tuesday morning the two lawmakers held a press conference on the street outside after a fruitless discussion with Menyhért Dobos, leader of the public media’s TV division. Following the press conference, they were once again refused entry – the MPs called the police only to be informed that they cannot help them. Dániel Papp replied to the questions addressed to him by the MPs on Wednesday. In his response, Papp admitted to some mistakes (even blaming the shock caused by the MPs’ recent sit-in for inaccurate reporting from years ago), but mostly cited the official procedure for making a complaint against the television, and dodged the questions regarding the recent scandals surrounding specific pieces of reporting done by the public media.